Browned butter oatmeal chippers are dense, chewy oatmeal cookies with butterscotch, milk chocolate, white chocolate and nutty undertones of browned butter. Cookies are a pretty big deal around my house. Partly because, well…they’re cookies and cookies are awesome, but the other part firmly hinges on my boys fierce need for anything that could potentially serve as a vehicle for getting massive quantities of chocolate chips into their mouths. I have no idea where they get that particular character trait from, but the need is intense. Awhile back, Son #1 wanted to artistically express his love of all things cookie by photographing himself with our cookie jar. (He set up the shot with the help of a timer and another counter top.) He and his brothers have even gone so far as to leave sticky notes on the Cookie Jar Bear’s paws that read Feed Me! My belly is SO empty! Or my personal favorite, Please Feed The Bears. Clearly, my boys require a lot of cookies in order to go on about their daily business of antagonizing their Mama and other such important intellectual pursuits as: memorizing every episode of MythBusters, building advanced architectural renderings of Ninjago Battle Arenas, and generally giving our home the overall casual/geeky/locker-room vibe that I’ve come to terms with love. 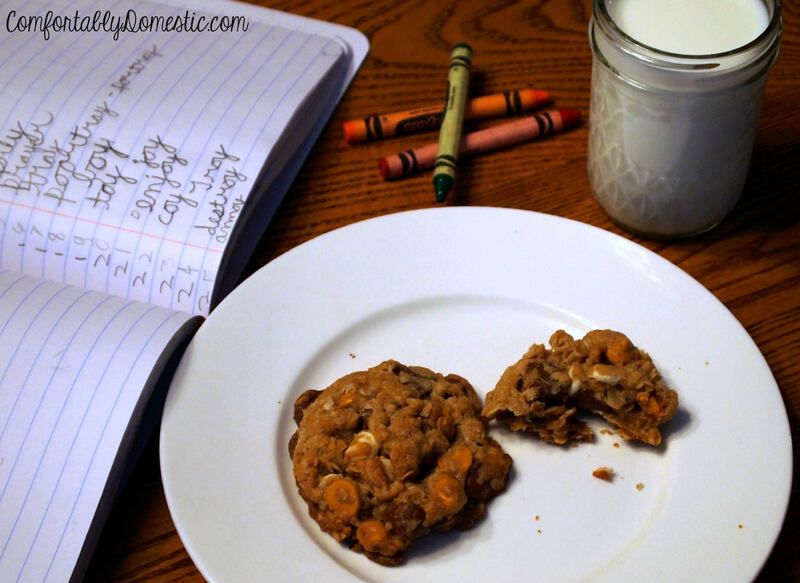 Lately, my boys have been requesting these Browned Butter Oatmeal Chippers over and over again. They’re pretty rustic as far as cookies go, but they have a lot of other things going for them. For one thing, they are big! 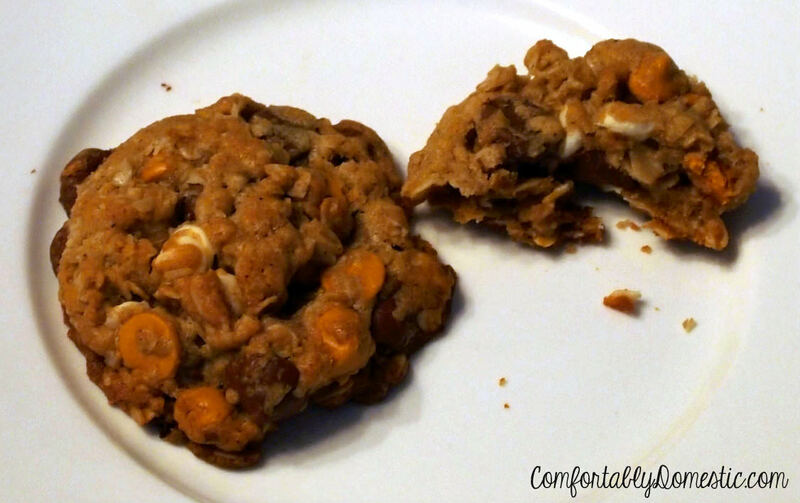 For another, they’re crunchy yet still chewy, with just enough cookie dough to hold all of the chips together. 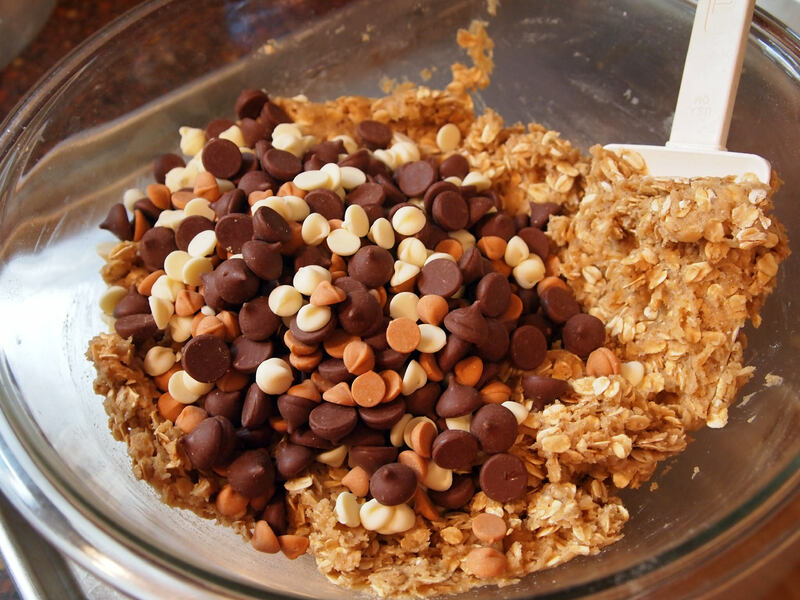 And just to sprinkle a little more Awesome over an already great cookie, you can mix the cookie dough using just two bowls and a wooden spoon. No messy mixer clean-up required. What’s not to love about all that? 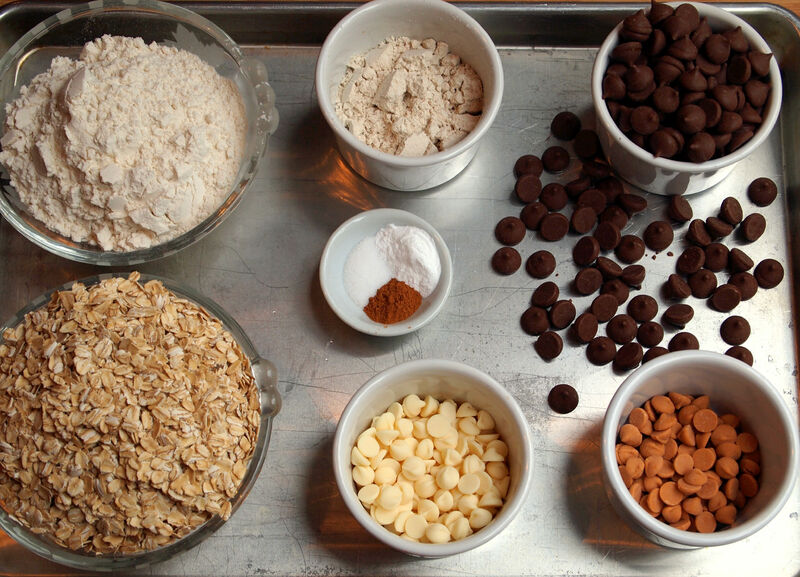 Ingredients for the first bowl are: All-purpose flour, oat flour, milk chocolate chips, white chocolate chips, butterscotch chips, old fashioned oats, baking soda, salt, and cinnamon. 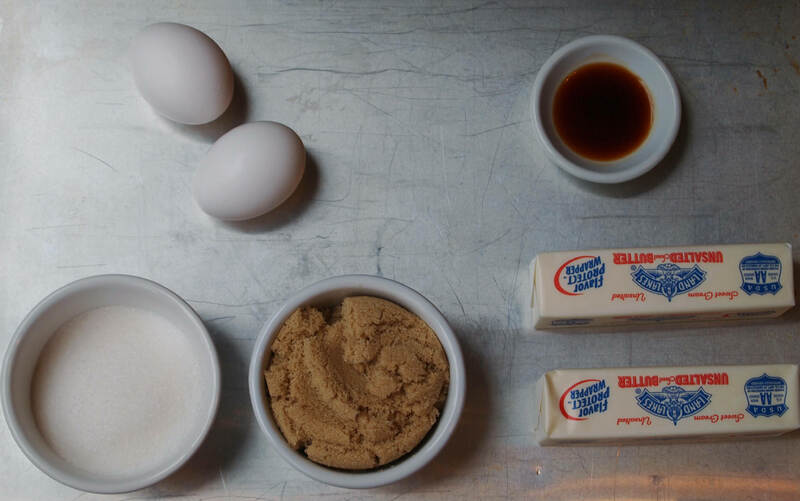 The ingredients going into the second bowl are: unsalted butter, brown sugar, granulated sugar, eggs, and good vanilla extract. 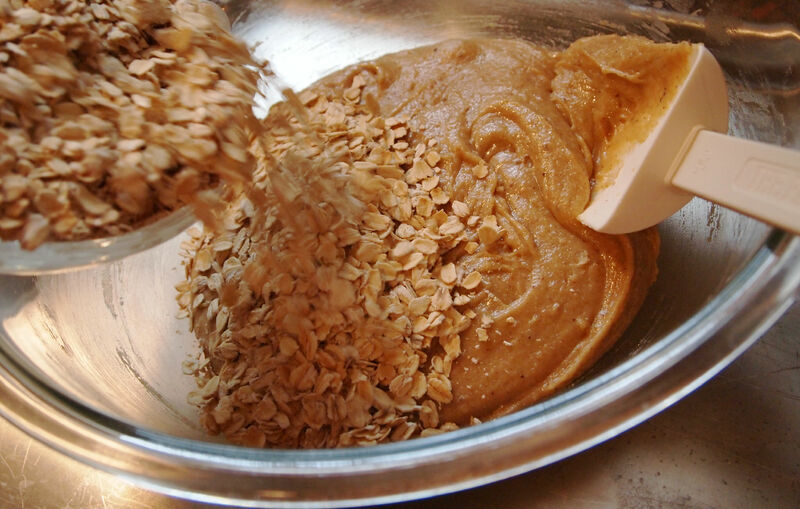 Grind the bejeezes out of a couple of handfuls of rolled oats in a food processor (or blender) until you have enough oat flour. 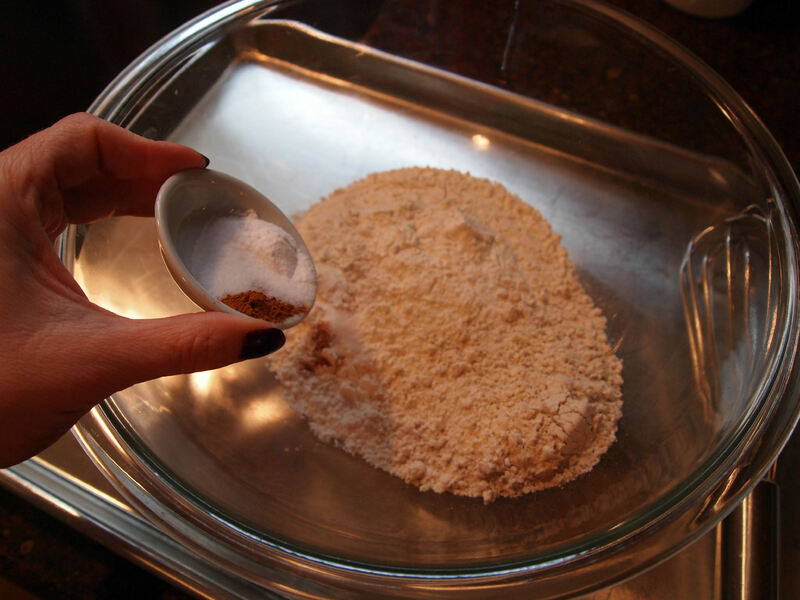 Omit the oat flour and instead add an additional 1/4 C. of all-purpose flour. Forget that I even gave an option #2, and just grind your own oat flour because it gives the cookie a nice dimension of flavor. Whisk the dry ingredients together to aerate and combine matters, and then set it all aside. Prior to browning, the butter will first start to foam as the water from the butter evaporates and the milk solids separate. After which, the butter will bubble rapidly and sound kind of violent, but don’t worry. In a little while the butter will simmer down a bit to a low boil. This is the beginning of the process to clarify butter, but that’s a story for another time. Keep simmering the butter on low heat, giving the pan a little swirling periodically, until the butter begins to turn a light amber color. Whatever you do, do not walk away from the butter for even a second! The melted butter can go from not-quite-browned to shoot-I-burned-it in a manner of seconds. Watch it closely! I realize that this seems like an awful lot of trouble for a cookie, but believe me when I tell you that the nuttiness imparted by the browned butter is totally worth the time invested. Pour the browned butter into a bowl, and allow it to cool. While you are waiting, preheat the oven to 375° F, and line the baking sheets with silicone mats or parchment paper. 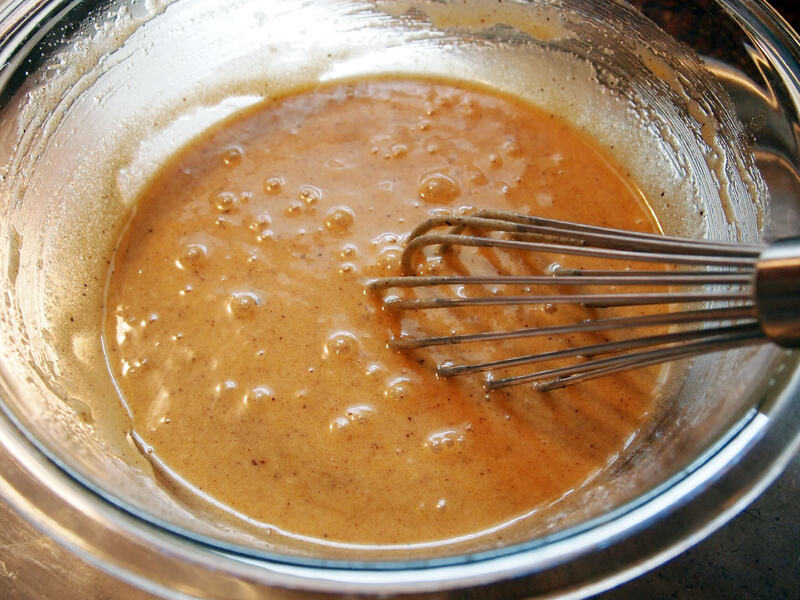 Once the browned butter is cool, add the sugars, vanilla, and eggs to the bowl. Whisk vigorously until everything is well blended. Pour the browned butter mixture into the flour mixture. Stir with a rubber spatula until just incorporated. Add the old fashioned oats and stir to combine. Old fashioned oats are mandatory, so don’t use those wimpy quick oats, and absolutely under no circumstances are you to use instant oats–both of those types of oats get mushy and gummy in a hurry once they’re moistened. Mushy and gummy oats are against the Law in my house. Fold in Trifecta of Chips: milk chocolate, white chocolate, and butterscotch. I used Hershey’s Mini Kisses for the milk chocolate, and they were divine. Now that’s some mighty dense cookie dough! Use a medium (2 oz.) scoop to portion the dough. 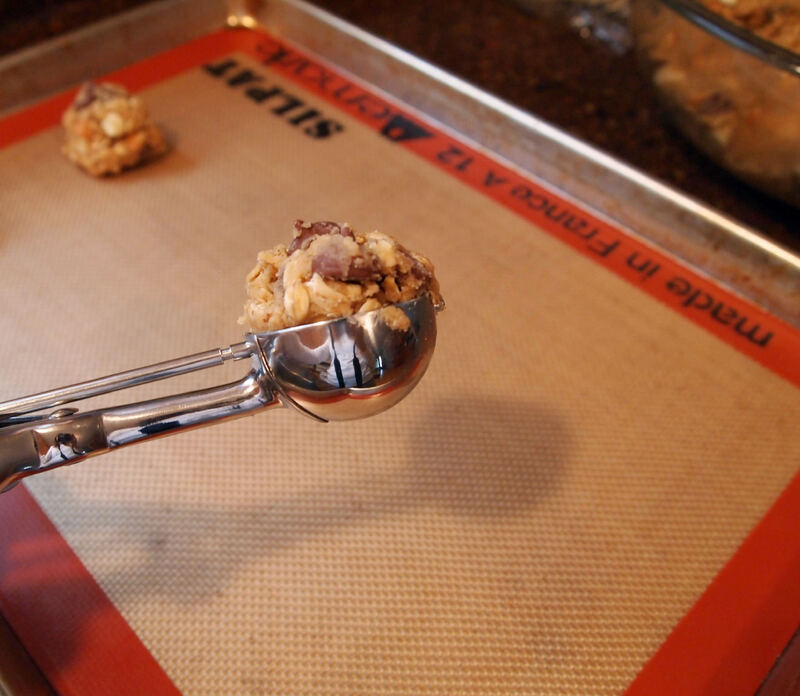 If you don’t have a medium scoop, use a heaping tablespoonful of dough for each cookie. I usually get about 3 1/2 dozen big cookies. Place the balls of dough 2 inches apart on the prepared baking sheets. Slightly flatten the tops of the dough with your fingers, as these cookies don’t “spread” a whole lot while baking. Bake in the preheated oven for 10 to 12 minutes, or until cookies are lightly browned around the edges and centers are set. 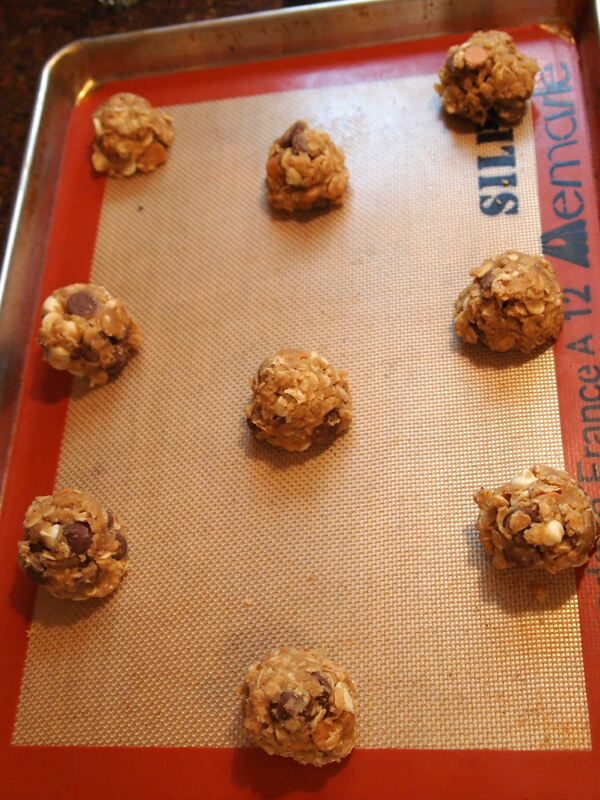 Allow cookies to cool for 2 minutes on the baking sheets before transferring to a wire rack to cool completely. Store cooled cookies in an airtight container at room temperature. 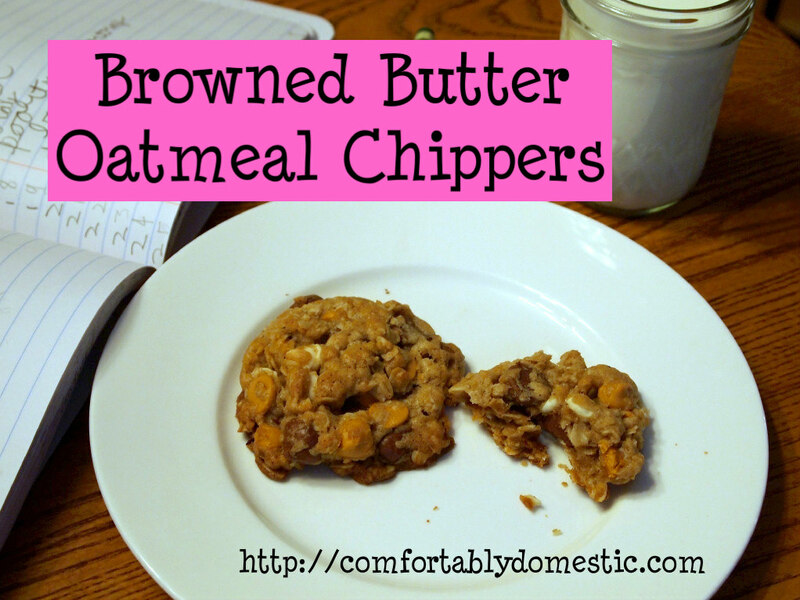 Serve Browned Butter Oatmeal Chippers with a big glass of cold milk for a great snack after school or work. Line baking sheets with parchment paper or baking mats and set them aside. 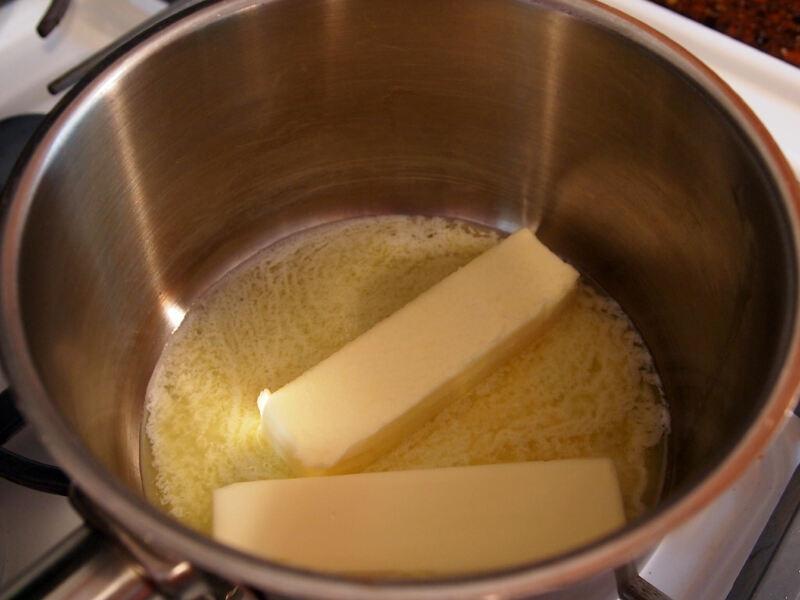 Melt butter in a small saucepan over medium-low heat. Continue heating the butter until it browns, but is not burned, occasionally swirling the pan to stir. (About 7 to 10 minutes.) Do not walk away from the butter while waiting for it to browning because it can go from not-quite-browned to burned in several seconds. 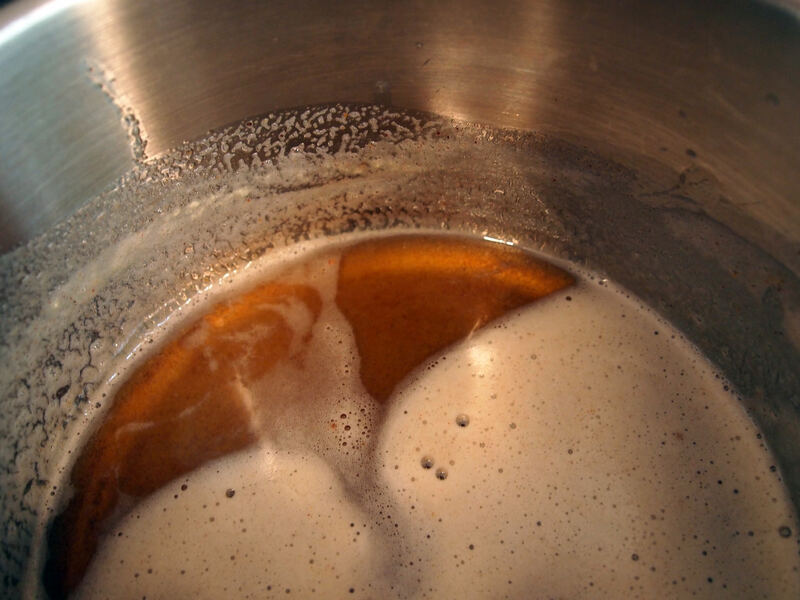 Once butter is an amber color, remove from heat and allow to cool. 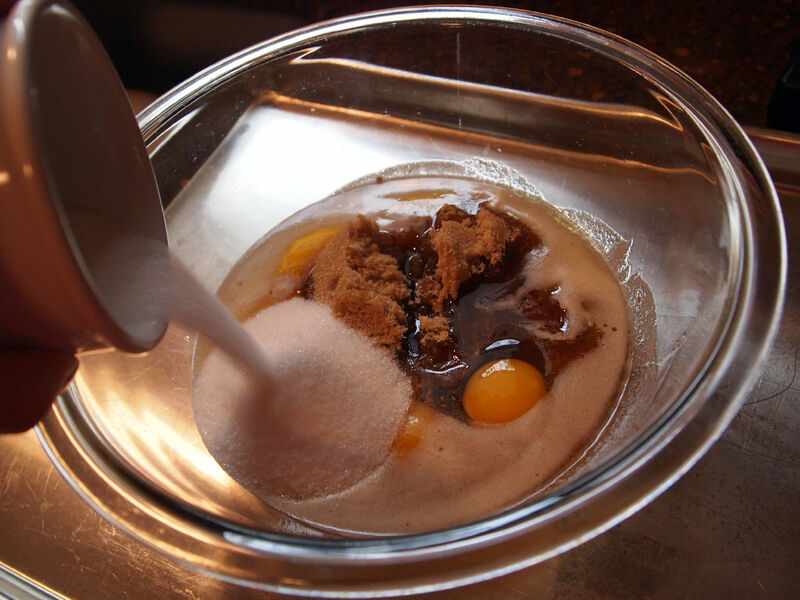 Combine the cooled butter, brown sugar, granulated sugar, eggs, and vanilla in a medium bowl; set aside. 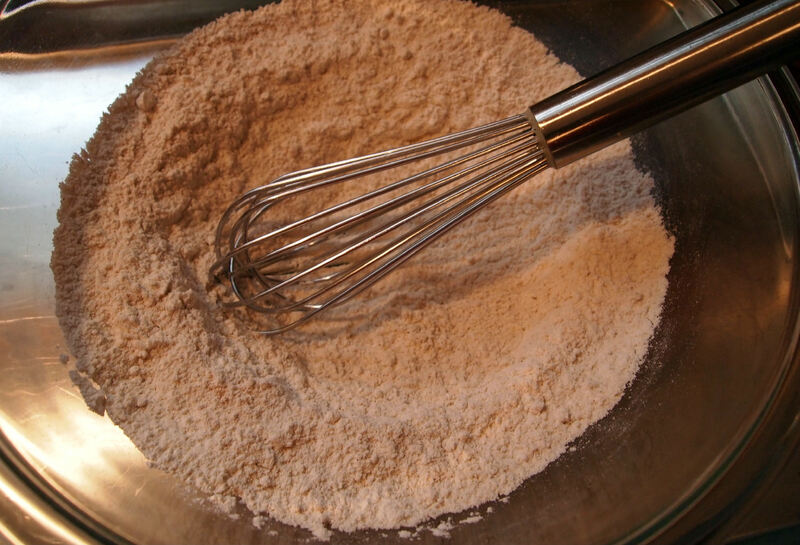 In a large bowl, whisk the flour, baking soda, salt, and cinnamon until blended. Make a well in the center. 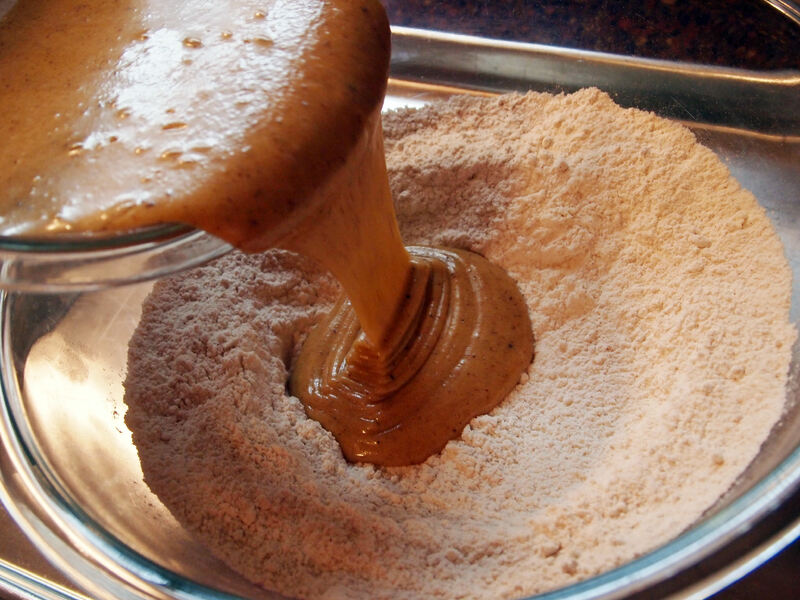 Pour the wet ingredients into the center of the dry ingredients; stirring with a wooden spoon or to combine. Fold in the oats until incorporated. Fold in the chips, pressing with the dough with the back of the wooden spoon periodically to ensure that they stick. This cookie dough is quite dense, with just enough dough to hold the chips together. Let cookie dough rest while the oven preheats to 375 degrees F. The rest period will allow the oats to absorb some of the moisture in the cookie dough. 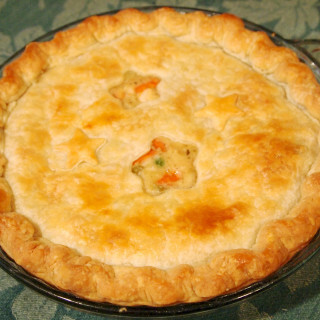 Once the oven is to temperature, portion the dough with a medium-sized scoop (about 3 Tbs.) and place the dough 2-inches apart on the prepared baking sheets. Flatten slightly with your fingertips. Bake cookies for 10-12 minutes, or until lightly golden brown. Allow to cool on the baking sheets for 2 minutes before transferring to a wire rack to cool completely. 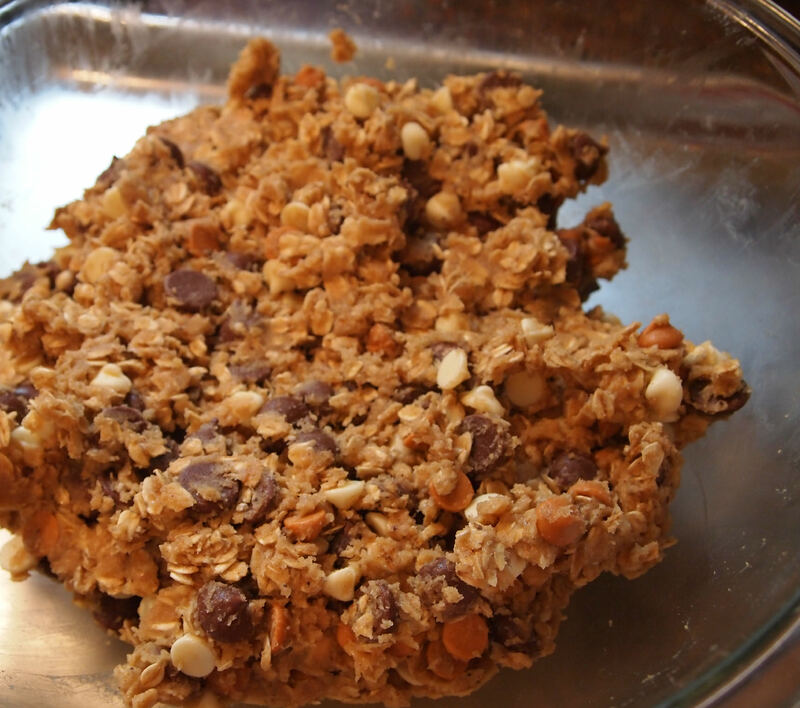 Yield 3 ½ dozen large cookies. These sound fabulous. And your life with boys (Ninjagos, Mythbusters, etc.) sounds oddly familiar somehow. ;) All three sit around like giant geeks when Mythbusters is on, for instance. Can you only use oat flour or do you have to use both? These cookies look delish. 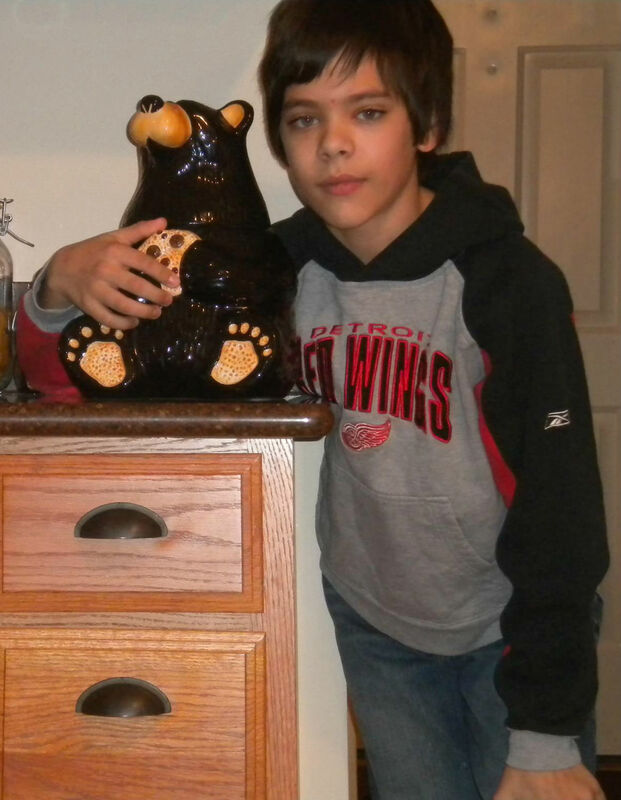 I love that cookie jar. And will be printing the recipe out to give it a try here. They look very yummy. Those cookies look awesome! But anything with browned butter in it is awesome by definition. Those things look way, way delish!! But honestly, I could get all over that dough. How sad is that? I can start off with full intentions of whipping up a big batch of cookies and by the time I get to the cookie sheet...I can scrape up enough dough to make about 4. 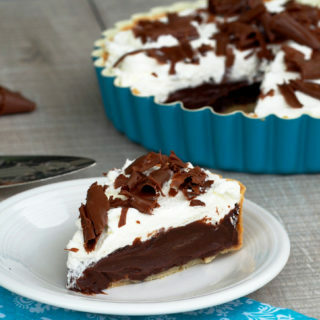 And forget adding the butterscotch chips. They'd be off to the side as my little snack while I was getting everything together. Luckily, they are too picky when it comes to cookies--so long as that bear is full. This would solve the issue of what to do with the orphan bags of white chocolate and butterscotch chips in my pantry, since you know, there are only like 1/4 cup left of each. I am only assuming that The Sons have the same biological mechanism that demands they eat chocolate chips as I do for frosting. That is the only Logical Explanation. Orphan bags of chips are the reason for this recipe. Son #1 just continues to impress. He's smart, cute as a bug, loves bears, and bakes. Yup. He's going to be a total chick-magnet in a few years. Get ready! BTW - the cookies sound amazing. All that butter! All those oats! THREE chips! Proof that more really is more and everything's better with butter. You have to tell me if J #2 makes these! I'd love a picture of that happening.